Exploding Doughnut: I had sent her love. It was a couple months after he was diagnosed with stage IV colon cancer. His health was still good at that point. We were watching TV together when the topic of love came up. "Love comes in many forms," my uncle said, a bit distracted by the television, "but that's okay because they're all TRUE." Today marks the one-year anniversary of my uncle's death and I know it'll be on my aunt's mind. After my uncle passed, I continued helping my aunt as often as I could. But shortly thereafter I got hired at the arts-and-crafts store and was recalled by my city job after that. I went from spending the night once a week, seeing my aunt most of the time, to maybe seeing her once a month, if that, when my work schedules would allow. Thankfully my brothers and mom have kept her busy. Perhaps it's for the best because I think I remind my aunt of all the chemo visits, bloodwork, doctor's appointments, etc. that the three of us went through (a role the rest of the family never really experienced). Even still, I'm sure this day will bring my aunt down so I wanted to send something colorful to cheer her up. Some Mail Art to lift her spirits and support her on this difficult day. 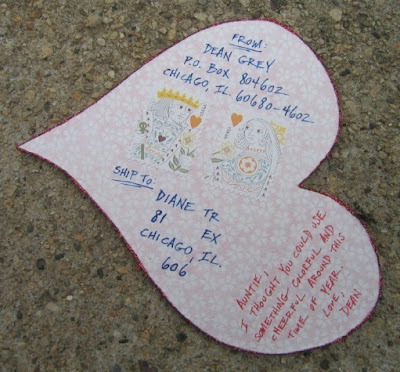 Similar to the hearts I sent out to bloggers last year, this one is slightly bigger in scale. Backing board was cut into the shape of a heart (I was inspired by the one I saw two weeks ago). 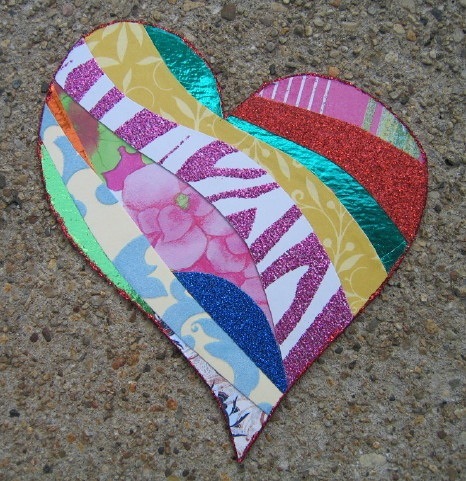 Next, decorative papers were cut into a variety of widths, glued down, then trimmed revealing the heart shape again. Finally, the entire edge was lined with shimmering red glitter! Why not, I say! I'm happy to report that my aunt has been adjusting well this past year (or at least appears to be) though I'm certain she still misses my uncle terribly. I know this heart made her smile, and helped her tremendously. I also bet receiving this reminded her of so many happy memories. It's crazy what glitter can do, eh? And bless your aunt and uncle both. I'm sure this heart really helped your aunt. Really made her day shine. You have a big heart, Dean. You are so thoughtful and so loving. I'm sure your aunt understands why you aren't there as frequently as you used to be, and even more, appreciates all the time you gave her and your uncle. I cannot believe it has been a year already. It doesn't seem that is has been that long. I will keep you, your aunt, and the family in my thoughts and prayers. It is never easy to adjust to losing those you love. I have no doubt your love was received by your aunt, and she felt the love in the hard word you did for her. The heart is absolutely beautiful. Consequently, I still have mine wonderfully displayed in my classroom for all to see. It is a great reminder that a great friend is close by in spirit, even though he lives several states away! you're so lovely and helpfully to your whole environment that it's a shame that nobody cares on you as you would do. I must say that everybody just could be happy to know you. I still am surprised and astonished by your grace. I said it yet, you're one of the best persons I ever met. It was around the time you found your Uncle was ill that I started reading your blog. Once again I am very sorry for your loss, even though a year has passed. I can imagine it must still be hard. The mail art is a sweet touch and I am sure your Aunt will appreciate it, not as much as she would appreciate your time though. How cool would it be to have an actual glitter heart beating inside of me! Yes, I think she definitely understands. 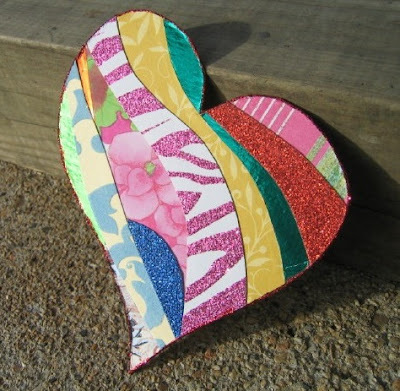 It made me smile reading that you keep your Mail Art heart in your classroom! I can get by, Ian. I have two jobs to keep me busy. I'm more worried about my aunt since she retired last year to help take care of my uncle. With all of her new free time, well, she has less things to distract her from the loss, you know? You are a really, really great nephew! Bless you! What a great example of why its the thought that counts more than the actual gift. "Love comes in all forms!" You sure did send love to your Aunt, what a beautiful piece of art, she will be so blessed by it. Hard to believe it a year since your Uncle passed, you were there for him in a major way. Yes, it's hard to believe it's been a year. That is a beautiful heart, like the heart of its creator.